Aceh State Museum or Museum Negeri Aceh is one of the oldest museum in Indonesia, that located in Banda Aceh. This museum is the etnografi museum from the indigenous tribes in Aceh. 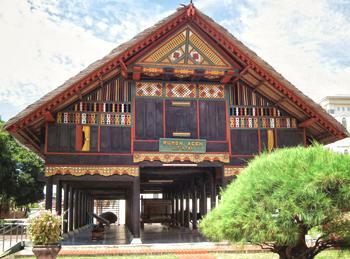 Aceh Museum was build during the reign of the Dutch East Indies, with the form of Traditional House of Aceh (Rumoh Aceh). The buildings were taken from the Pavilion Aceh that placed in the arena Colonial Exhibition (De Koloniale Tentoonsteling) in Semarang on 13 August to 15 November 1914. After the independence of Indonesia, the museum became the property of the Regional Government of Aceh. In 1969, under the initiative of Teuku Hamzah Bendahara, the Aceh Museum was moved from the old place (Blang Padang) to its present location in Jalan Sultan Alaidin Mahmudsyan on a 10,800 m2 land. On September 1, 1980, Aceh Museum was officially made a provincial museum under the name Aceh State Museum (Museum Negeri Aceh). The official inauguration was made by the Minister of Education and Culture at that time, Dr. Daoed Yoesoef The historic Rumoh Aceh has survived from the 2004 earthquake and tsunami. In line with the Government program of development of culture, in particular the development of the museum, since 1974 Museum Aceh got rehabilitated in its old buildings and simultaneously with the procurement of new buildings. The new building which has established permanently is the exhibition hall, conference hall, temporary exhibition hall and library, laboratory and home offices.